Considering my milk pitcher temperature-reader-thing only goes up to 220-deg, this was a lot of guess work and turned out fairly well. 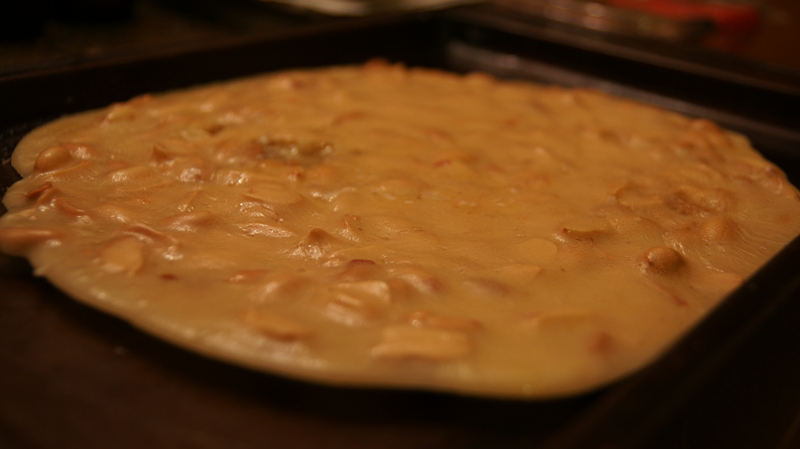 Candy is not the easiest thing to make, but you can’t taste an amber ale without peanut brittle (as we’ve come to find out). The thing is, the stuff from the grocery store is really expensive and has gross ingredients like high fructose corn syrup and partially hydrogenated peanut oil. This was the recipe I used, and, apart from being a little sticky it turned out pretty darn good. Over medium heat, bring sugar, corn syrup, salt and water to a boil. Stir until sugar is dissolved and add peanuts. Stir frequently and continue to heat until candy thermometer reads 300 deg-F. Remove from heat and immediately stir in butter and baking soda. Then, immediately pour out onto greased baking sheet. Pull the mixture with two forks into a rectangle and let cool completely. Then snap into pieces, and call a dentist.